An old Large Mound poster today. I don't even know what year this was, 2005 maybe? This is a drawing of me being silenced by someone. The Music Room was a great but short lived venue on Abbey Street, above the Firestone Pub. It was run by Smiley Bolger who had the walls covered with a million brilliant Thin Lizzy related posters and newspaper articles. Anyway I remember the gig was a bit of a disaster, we (large mound) had to pull out on the day and Steerage were replaced by Omelette. I don't think they have played a gig since. Steerage are now Mumblin' Deaf Ro's backing band and Yakuza are still sticking it out in Belfast, new album on the way I believe. The Fall are back in Dublin in April and here's an early poster for the gig. I took some time out and did this drawing of Mark, I wasn't sure what I was going to do with it. Er, very little as it turns out. I gave him a nice white shirt and drew 'The Fall' in Clarendon and that's about it. The gig is still a bit away and this poster may change yet but a few of then did go up at this week's Seasick Steve gigs so it is out there. Poster for a triple header happening next month. 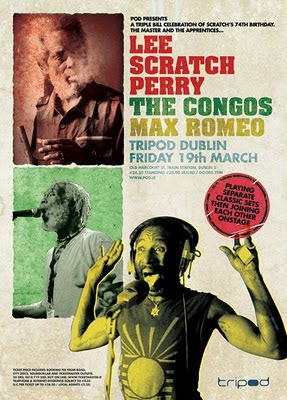 Lee Perry, The Congos and Max Romeo. If you think this poster resembles this that's because it does. Nice poster, it works better in some of the other formats I've done it but that's fine. Here's one from 2008. Gravenhurst with opener Florence & The Machine. Not a bad poster, not great but not bad. Here you go, something a bit different today. Odessa's NYE party. This is the watered down version that went out. Fair enough. 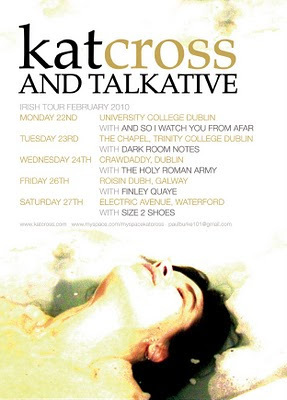 French musician Kat Cross comes to Ireland for a few gigs this month. Here's a tour poster. Here's another new one. Northern Irish band Two Door Cinema Club are getting loads of attention at the moment and their album is about to be released or maybe it's out already. Anyway their album cover has a cat on it so I did a catty poster. Come to think of it, this hasn't been approved yet so it may well be changed. I hope not, I quite like it, and cats. 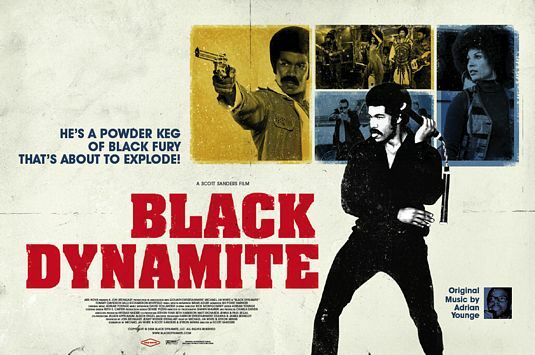 2010 poster. 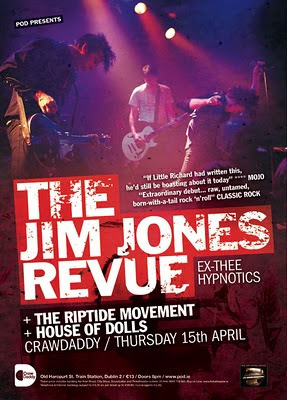 The Jim Jones Revue play Dublin in April. The promoter wanted to use this photo of the band rocking out. Jim seems to use Franklin on everything so I went with that. I just hope these things represent the bands and that when they arrive in town they're pleased the job done. I have simple goals. Duke Special two town tour from 2007. Check out the dates, a bit mad. 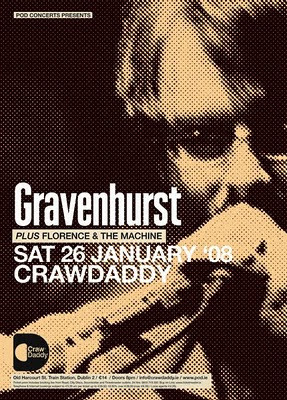 One from the early days of the CrawDaddy venue, probably 2004. 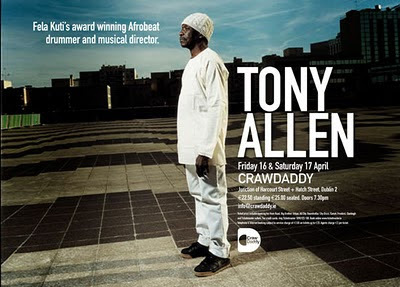 Tony Allen played two nights. All I remember about this one is that the quality of the image was very bad. I did a little bit of work on it so it was almost good enough then the deadline came and I decided to just go with it because it is such a cool photo. 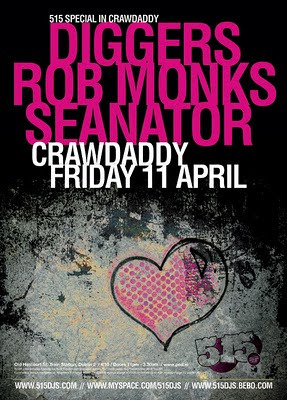 I really like the format I did all the CrawDaddy stuff in back in those days, I might start doing some of those again. Brand new poster today. 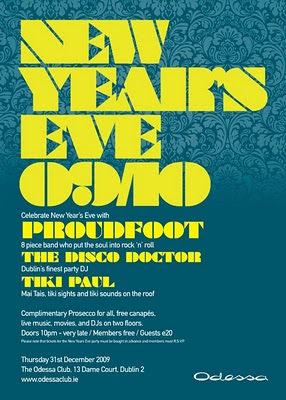 This is for Asian Dub Foundation's Dublin gig this month. A quick look at their website gave me plenty to go on. None of the elements in the poster actually came from their site, I rebuilt it with images from various sources and drawn stuff. 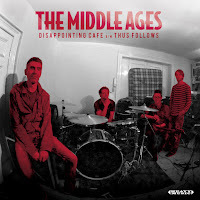 The halftone on the photo of the band didn't really survive the resize for this blog but is fine in print. 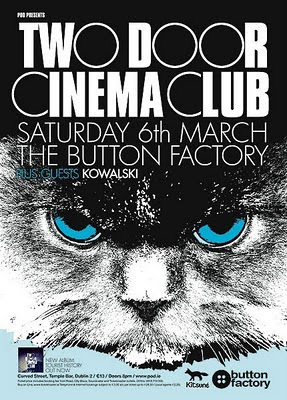 Nice flat poster for Steve Reid playing The Button Factory in Dublin in 2008. 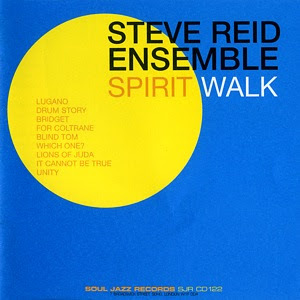 This poster is just a variation of this cover. Grand. I just found this file while doing some backing up on my computer. It's from 2008. The reason I'm posting this is that I have absolutely no recollection of doing this one. From the looks of it I'd say it was a last minute booking and instantly required poster. Could have been worse. New York band The Blood Arm came to Europe in 2006 and played Dublin. Also playing was British band Pull Tiger Tail and Large Mound. The poster is a modified version of their "Lie Lover Lie" album.